The risk of developing ovarian cancer increases with age and the condition primarily afects post-menopausal women; thus, it is vitally important that GPs refer older women who are experiencing any of the common symptoms of ovarian cancer for the appropriate tests. Ovarian cancer is the fourth most common cause of death from cancer in women afer lung, breast and bowel cancer.1 Of the 6,800 women who are diagnosed with ovarian cancer each year, only 40% will be alive afer fve years.1,2 This is because most women are diagnosed when the cancer is already at an advanced stage. Women who are diagnosed when the disease is confned to the ovary (stage 1) have an up to 90% chance of survival. Terefore, there is general agreement that early symptom identification, with a high index of suspicion for ovarian cancer, has the potential to improve prognosis. Ovarian cancer was known as the “silent killer” because its symptoms seemed to only present when the disease was already advanced. However, recent studies have shown that many women, even those with early diagnosis, have symptoms prior to diagnosis. In fact, increasingly, it has been shown that symptoms are present for up to a year before diagnosis.2 The symptoms of ovarian cancer are often vague and are associated with less serious conditions (such as irritable bowel syndrome), which makes the clinical diagnosis of ovarian cancer particularly difficult. However, there is accumulating evidence that women with the disease experience specific symptoms more frequently, more severely and more persistently than women who do not have the disease. As with a signifcant number of breast cancers, mutated RCA1 or BRCA2 genes may be the cause of some familial ovarian cancers.2 Certain population groups are more afected by these mutations than others. For example, Ashkenazi Jewish women have a 1 in 40 chance of carrying a mutated gene. Women from the Polish community also have an increased risk of developing the disease.2 About 1 in 10 cases of ovarian cancer occur in women who carry the BRCA1/BRCA2 mutations or other faulty genes linked to cancer. Women who have two or more first-degree relatives who were diagnosed with ovarian cancer at an early age may be at increased risk of familial ovarian cancer. Healthcare professionals should consider referring women who are at high risk to a geneticist for further counselling and risk management. This includes prophylactic removal of the fallopian tubes and ovaries as well as ovarian screening as part of a clinical trial. Women eligible for enhanced breast screening due to family history should be made aware of the signs and symptoms of ovarian cancer. Key messages for women regarding symptoms are available on the NHS Choices website at: http://bit.ly/cteylc. Ovarian Cancer Action is the UK’s leading ovarian cancer charity, dedicated to improving women’s chances of surviving ovarian cancer by raising awareness of the disease and its symptoms. It also funds vital research at the Ovarian Cancer Action Research Centre and gives a voice to people afected by the disease. One of its campaign is to raise awareness of the symptoms of ovarian cancer among both women and healthcare professionals—its “*Remember the symptoms” awareness campaign featuring the actress Emilia Fox was launched in September 2009. Each March, for Ovarian Cancer Awareness Month, it distributes symptoms awareness leaflets and posters to every GP surgery in the UK. Its website www. everywomanshouldremember. org.uk is the UK’s first online symptoms awareness campaign, and so far has received more than 2000 pledges from members of the public to remember the symptoms of ovarian cancer and make other people aware of them. In 2006, Ovarian Cancer Action established the Ovarian Cancer Action Research Centre at Imperial College Hammersmith. This is the first facility of its kind in the Europe. Under the leadership of gynaecological oncologist, Professor Hani Gabra, the Centre is becoming an international hub for ovarian cancer research, fast-tracking new treatments from bench to bedside. The Centre is a collaboration between Hammersmith Hospital, Imperial College London, The Royal Marsden Hospital and the Institute of Cancer Research. It is uniquely placed to enable experts to share and develop their understanding of the disease through researching fundamental biology, early detection and new and improved treatments. In addition to raising awareness and undertaking research, Ovarian Cancer Action listens to the concerns and experiences of people with an experience of ovarian cancer and provides a platform for them share their experience with others affected by the disease, healthcare professionals, politicians and policy makers, and the media, via the Ovarian Cancer Voices initiative. The charity has also devised a symptom diary to help women keep a note of the persistency and severity of their symptoms and aid their conversations with their GP. 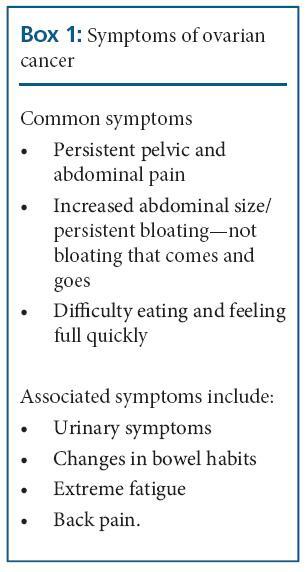 Because the symptoms of ovarian cancer can be vague, the diary can help to diferentiate between ovarian cancer and less serious conditions such as IBS. For more information on ovarian cancer and Ovarian Cancer Action’s work or to request awareness materials, visit www. ovarian.org.uk, call 0300 4564700 or email info@ovarian.org.uk. The Symptoms Diary can be downloaded from the homepage.